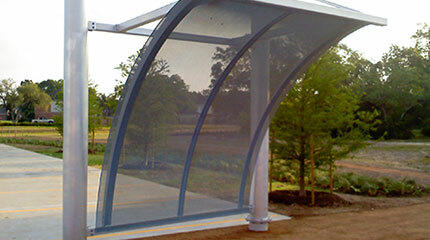 Screens can be made of almost all Marco Specialty Steel’s products. With a large variety of openings, wind, snow and water pass easily through, which reduces wind and snow loading concerns. Screening products are ideal for façade screening, decorative and security while providing shade and privacy. The open area allows for natural day lighting, ventilation and lite lines in and out. Screens are considered a Green application by reducing interior heat gain and solar glare. …And more. We work with several different materials and processes to offer everything from heavy-duty structural screening to finely made decorative accents. Keep reading to learn more or contact Marco Specialty Steel to discuss your projects and request a quote. Materials we work with include carbon steel and stainless steel, aluminum and more. Whether you require something cost-effective and durable, something lightweight and flexible, or something tough enough to withstand repeated exposure to the elements, we’ll match you with the right material for the job. 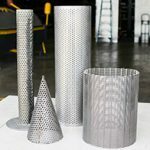 Many types of industries use metal screens in a variety of ways. Steel strainers, trays, cylinders and baskets are widely used for products to be separated. 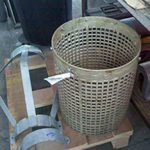 Steel or stainless steel baskets are versatile and come in wire cloth or perforated metal. Industrial wire baskets come in many shapes and sizes. We custom make wire baskets. Perforated metal baskets are common as well. Contact us today for more information. 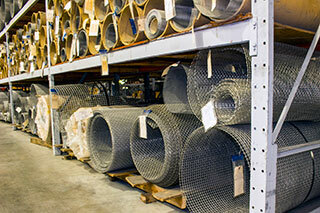 Marco Specialty Steel has been fabricating wire mesh and perforated metal into cylinders for many years. These cylindrical shaped metal consists of one or more layers depending on our clients needs. Extruded screens are most commonly created from steel or stainless steel wire mesh. 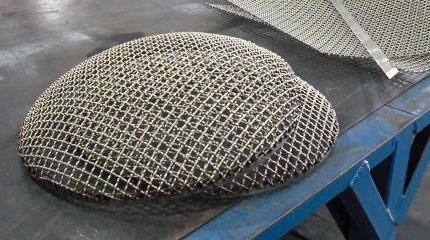 These wire mesh discs, or screen packs are used to filter the component of the extrusion process. That’s why they are call extruder screens. They have several different wire mesh discs in a pack with varying mesh sizes to provide layers for the product to be passed through the screens which provides the optimal screening. Our screening fabrication capabilities are complemented by a range of value-added services. All products can be cut and shaped to the dimensions of your choice, making the installation process faster and easier. We also offer many finishing options for our products, including powder coating in a range of colors and aluminizing for improved corrosion protection. Other services we offer include welding, polishing, plasma cutting and shaping. We also provide blueprint takeoffs as well as general consulting around a range of design and fabrication issues. Offering dedicated service, faster turnaround times and exceptional overall value, Marco Specialty Steel is proud to be a partner to contractors, architects and other clients in the construction and engineering industries. Count on our team for all your screen fabrication needs. To request a quote or to learn more about our services, get in touch today. Reach our Houston head office by phone or using our online form.